If you like Rick and Morty and have a lot of books then you should check out these Rick and Morty portal bookends. 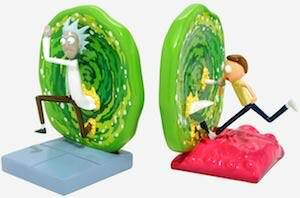 The bookends come in a set and one bookend shows the green portal and Rick is coming out of it and the other bookend shows the same portal only now you can see Morty getting into it and you can even see a part Rick. And now you put your books between the two bookends and then it will look just amazing on a bookshelf. No longer do you books be a messy stack as now they can be organized and look amazing.